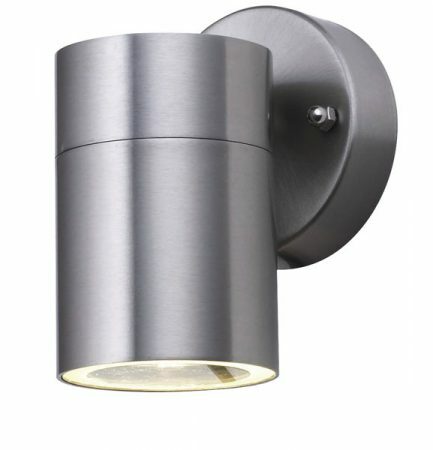 This Woodstock stainless steel outdoor wall down spot light with clear glass lens is stylish and contemporary. The IP44 rated splash proof, stainless steel fitting has a round wall plate and sleek cylindrical down light, with a subtle LED light to provide a bit of brightness for your outdoor areas at night. A stainless steel outdoor wall down lighter, with a circular wall mount and downward facing circular lens to wash the wall below with light. Part of the contemporary Woodstock range of IP44 rated outdoor lights. Supplied complete with an energy efficient 3w GU10 lamp. Covered by a three year manufacturers finish guarantee. Please follow this link to view the installation instructions. This outdoor light is supplied by Searchlight, who manufacture some of the best traditional and modern classic designs such as the Woodstock stainless steel outdoor wall down spot light with clear glass you see here.